Brazilian Jiu-jitsu community outreach attempts to bring value and dignity to the children of international refugees. Based in Charlotte, North Carolina Project 658 is an organization that works with the international refugee community. Project 658 mission aims in helping get migrants established into their new home country and provide them with the basic necessities and skills required to thrive. The Holistic Care ministry helps them with proper housing, job training, clothing, and academic/education services. Project 658 continues to expand its programs, adding new classes and giving their refugee recipients more opportunities to learn and grow. 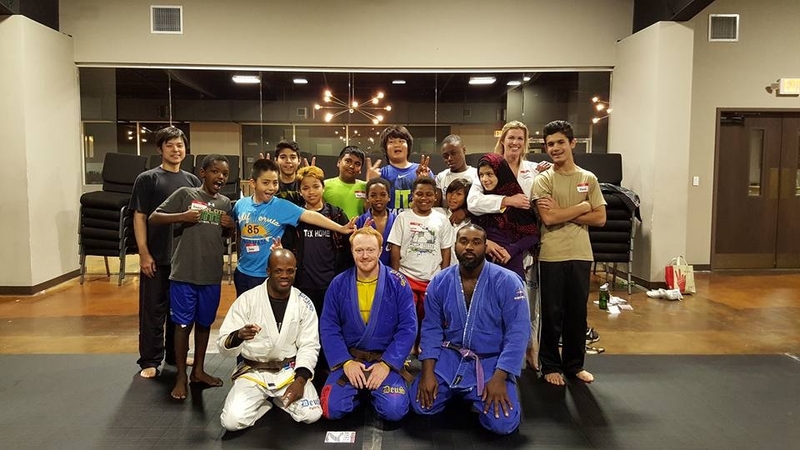 Known for his artwork in the MMA community and other charitable contributions in the Queen City JM Smith (Founder of Disciple Dojo) has joined forces with Project 658 offering a free weekly BJJ/self-defense class for refugee kids in the Charlotte community. It’s only the second month into the program and the enthusiastic participants have already caught the love bug for Brazilian Jiu-jitsu. BJJ Legends got the opportunity to talk with JM Smith about this philanthropic program and the building of Refugee-Jitsu. You are known for your charitable contributions in the MMA community and in your home region of Charlotte. How did the collaboration with Project 658 come about and what got you motivated to do it? JM: Honestly, man, it came about through frustration. As I watched the international refugee crisis unfold over the past year, I found my heart breaking for the millions of families—many of them children—who were simply trying to get away from hellish war zones over which they had absolutely no control or influence. I was also frustrated by the seeming lack of concern that many of my fellow Christians were showing and the stereotypes they were helping to reinforce about refugees through the comparisons to things like poison or an infestation or any other number of dehumanizing labels I was seeing shared on social media. The more I started to push back against such stereotypes and the more I started encouraging Christians in particular to reach out in love and service to refugees, no matter where they come from, the more I was met with the “What are YOU doing about it then? How are YOU helping?” type responses. I resolved that while I don’t have financial or material resources (being a starving-artist/Bible-teacher! ), I should at least do something here in the city in which I live…which just so happens to have a large refugee population. So I reached out to my friend Rob, who works with various refugee ministries here in Charlotte, and asked him who I could talk with about offering a free weekly Jiu-jitsu class to refugee families. He put me in touch with Project 658 and I sent them an email proposal for such a program. My friend Laura, meanwhile, had also met a member of their staff and shared with her about my desire to offer such a class as well as women’s self-defense seminars for the members of the refugee community. So when I reached out to them, they were very receptive. We met at their facility the following week in early December and they were very enthusiastic about the idea, as they were looking for something to offer the kids in addition to traditional sports like soccer. We decided to offer an initial one-time class and see who showed up in order to gage the level of interest. So I spent all of December praying about it and trying to raise the needed funds to purchase mats and some basic equipment needed to get the class going. While I received some criticism from a few people who simply—and ignorantly—equate “refugee” with “terrorist”, the overwhelming majority of responses have been very supportive. From fellow church members to local businesses to BJJ friends from all over the country, people donated the needed funds and thanks to their generosity and support, the program is now in its second month! How was the overall reception of idea bringing Brazilian Jiu-jitsu to the Project 658? JM: They have been totally supportive. Not only does it give the kids a positive place to come and hang out for 2 hours on a Thursday night, it also teaches them skills that could save their lives one day while at the same time instilling the values of the martial arts into them at a very formative stage in their lives. Unlike other sports which require different practice times, expensive equipment, and weekend games, this simply requires the kids to show up once a week with a readiness to learn and have fun! They’ve asked us to do a BJJ Summer camp for a week in July and we will also be offering periodic weekend Women’s Self-Defense seminars to the community. Talk to us about some of the students and also your experience teaching them thus far? JM: I’m just getting to know the kids myself, but they are simply awesome! I tell people our class is like the United Nations of BJJ. We have kids from West Africa, Latin America, Afghanistan, Nepal, Pakistan, Myanmar, and Southeast Asia! Catholic, Muslim, Buddhist, Hindu… all developing genuine friendships that inevitably result from doing BJJ together! That’s the beauty of the martial arts — it brings people together from the most varied backgrounds and shatters the dividers that the outside world frequently encourages us to maintain. Many of them are coming from conditions that most of us could hardly imagine growing up in. They are coming from vastly different cultures all over the world… yet they are like any other middle school or high school kids you’d meet in your own community. They laugh, they cut up, they rag on each other, they joke around, they watch TV, they go to school, they have homework, they deal with all the normal experiences kids deal with at that age… but given their unique backgrounds and experiences, they show a level of gratitude and a craving for love and affirmation that is simply unbelievable. They practically fight each week over who gets to mop the mat, who gets to pull up the tape, who gets to roll them up, etc. They know that they have been given this equipment and they are intent on taking care of it! They are so grateful that they have this class and it is absolutely heartwarming to see. For example, two of our students are a teenage brother and sister from Afghanistan whose father fought alongside the Marines against the Taliban. In addition to translating for U.S. forces, he was also a trained boxer and kickboxer who taught the Afghani police hand-to-hand combat. Now, he works in a factory here in the city and is studying to get his commercial truck license in hopes of building a business here where he can employ others and provide jobs for the community. But with his busy schedule, he is not able to train his son and daughter in self-defense at home like he wants to. So when he found out we were staring this class, he was ecstatic! He and I have become friends and he’s made sure his kids are there every week… and every week they are so eager to show me that they remember what we did the previous week and how excited they are to be there again. It’s every instructor’s dream to have students and parents so dedicated! So I take it they are enjoying their lessons in Brazilian Jiu-jitsu? JM: Man, they are loving it! Every time I show a new technique their eyes get wide and you hear verbal “ooh”s and “ahh”s…it’s great! The only thing they know about martial arts is what they’ve seen in movies. The only thing they know about grappling is what they’ve seen watching WWE. They always ask me if I’ll show them various pro-wrestlers’ signature moves. Haha, I find myself frequently bursting some bubbles about what martial arts and grappling actually consist of in reality, and what is fantasy. But we have a lot of fun, even while maintaining an overall sense of discipline and respect. Various instructors have different goals for their students what is your goal with the refugee students? JM: My goals for them are simple: 1) to equip the kids with a basic working knowledge of Jiu-jitsu primarily for self-defense 2) to give them a place each week where they are encouraged, loved, and treated as normal kids rather than “foreigners” 3) to foster genuine deep friendships among them as well as within the larger martial arts community here in Charlotte 4) to help us as a city — and perhaps one day a nation — see those who have come to us from all over the world as fellow human beings, bearers of God’s Image; to break down the walls of suspicion and hostility that many in our society thrive on keeping in place. And lastly, 5) to reflect the love of God that I’ve been shown my whole life into the lives of these kids and their families regardless of their beliefs, background, or ethnicity. Project 658 is always open to volunteers coming to help with various sectors in their organization. 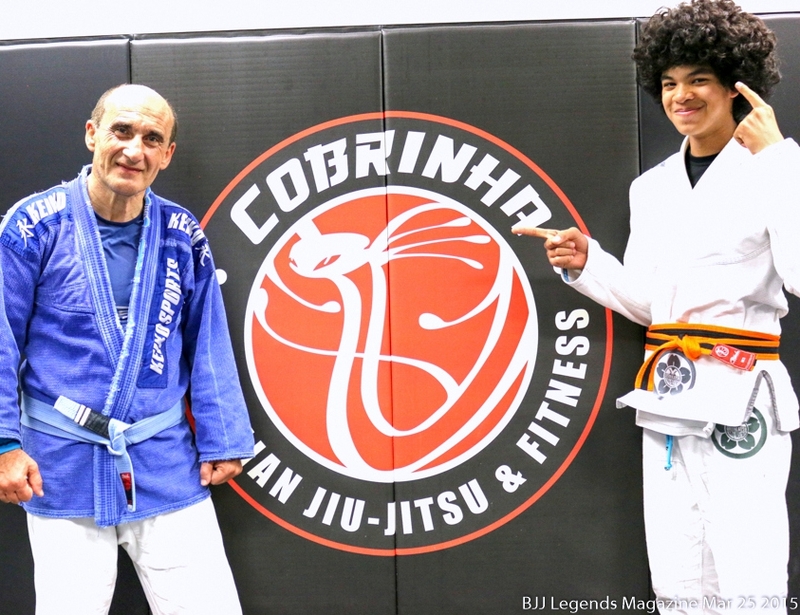 Is the option open for BJJ practitioners coming to assist with the program? JM: Absolutely! As I post each week on Facebook and Instagram, ANYONE in the area is invited to come help on Thursdays! Any grappler from any academy or gym with a good attitude who wants to meet some amazing kids and help encourage them in their training is invited to come help us whenever they are able, especially female grapplers! We are trying to encourage more women in particular to get involved so that the girls who come to class will have other girls to drill and roll with. There is still a bit of hesitancy, perhaps due to cultural backgrounds, when it comes to the girls and having such close contact with boys who aren’t a family member—contact which is a necessary part of BJJ, obviously. So to help overcome this hesitancy it’s always helpful to have women there who can not only train with them, but also show them that it’s ultimately possible to train with the boys in ways that do not compromise any ethical integrity. But male or female, grappler or novice, anyone who’d like to help is invited to come see what we do and meet some incredible kids each week. In fact, we’ve had BJJ students from at least four different local academies helping us in classes so far! It’s been great seeing so many different team patches and GIs on the mats with the kids, all under the single banner of “Jiu-jitsu”! What are some other resources you are using to expand the program? JM: The goal all along has been to make the class entirely free for any member of the refugee community. These families come here with almost nothing sometimes, and Project 658 is a huge help in getting them basic necessities so that the kids can live normal lives like any other kids in the city. So Disciple Dojo wants to make sure that this class and everything involved remains free to the families. From mats to train on, to striking pads/mitts, to GIs and rashguards, we want to make everything available to the kids. That doesn’t mean they don’t EARN the equipment though! Far from it! From day one we’ve stressed to the kids that while we do not require them to pay financially for the class and equipment, they DO have to pay for it… in dedicated attendance, focused training, and cleaning up and storing it all each week! The only way we can do this is through the support of the wider community, particularly the BJJ community. And the response has been encouraging so far. Deus Fight Co. has stepped up to support us by providing gis for the kids. As an artist, I’ve worked with Deus before on the Fight for the Forgotten gi when they found out about this program the owner, Geoff, sent me a text that simply said “how many gis do you need?”! Deus has a line of gis based on various cities’ NFL teams that they use to help raise funds for different charitable causes , so I said that given the Panthers Superbowl run this year, it was time to have a “Carolina” gi in the lineup! They loved the idea and the gis are in production as we speak! In order to get their gis and white belts, the kids have to have perfect attendance for over a month, show that they are dedicated in class and paying attention, and help with cleanup and teardown of the mats each week. They are so excited, and I’m truly grateful for the awesome work that Deus Fight Co. is doing not just for our program, but for some incredible causes all over the world. I also use any proceeds from sales of my artwork and the gear I design to help fund Disciple Dojo as much as I can. I’m one of only a handful of artists I know of who focus on MMA/BJJ portraits, so any help in getting word out about my artwork is always appreciated and I love seeing my stuff hanging in various academies all over the world… because I know what it goes to help support! Eventually, I’m hoping that the program will continue to grow and as the kids move from basic self-defense BJJ into the more competitive aspects of the art, I would love to connect with a tournament that would consider providing sponsorships for some of the kids to compete. But that is still a ways off, I believe. Right now the focus is on building community and laying the foundation for the dozen or so kids we currently have in the class, while continuing to encourage others to join in as well. Finally 10 years from now what do you see for Disciple Dojo’s Refugee-Jiu-jitsu program? JM: Honestly, I don’t even know what it will look like 10 MONTHS from now! I’m just along for the ride! But my hope is that in 10 years there will be dozens of young 20- and 30-something adults in this city from all over the world who know that they are valued. Who know that they have come to a city where they are seen not as “foreign” or “different”, but rather as fellow citizens and members of the community. Who know the joys that come from dedicated training in the Gentle Art and who have a sense of self-confidence, humility, kindness, and integrity that come from the crucible of Jiu-jitsu classes. And most of all, who know that they are, loved as young men and women created in God’s Image and possessing intrinsic value and dignity. If even a handful of these kids end up experiencing this over the next 10 years, it will have all been worth it. Any final thoughts before we wrap up this interview? JM: I’ve been so encouraged by the response to our program. It shows that despite the geopolitical events surrounding us, there are people who have the courage to reach out with a hand of friendship rather than a fist of anger. I’m grateful for the support we’ve been shown by people from so many different backgrounds — from local academies, to members of the UG, to instructors from across the country, to church members, to companies like Deus Fight. Jiu-jitsu has a way of bringing people together who would otherwise likely not have much in common. This program is a testimony to that fact. I’m especially grateful to my instructor Derek “TC” Richardson for introducing me into the Renzo Gracie Jiu-jitsu family over nine years ago and modeled what it looks like to combine the martial arts with community outreach and self-sacrificial giving to those who may not be able to do anything in return. And I’m grateful for my training partners and friends at Renzo Gracie Charlotte/Leadership Martial Arts who have kicked, punched, twisted, cranked, smothered, smashed, and choked me silly for nearly a decade now. Outside of my biological and church families, they have been the biggest source of support and encouragement in my life.